Olives are considered fruits. In their natural form, olives are very bitter and nearly inedible. To get the amazing taste and flavor, olives are cured in brine or oil. 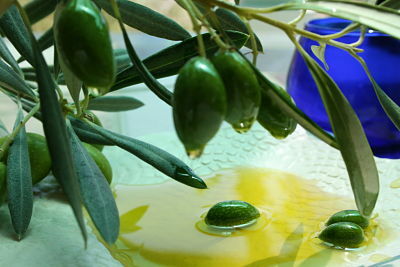 The extra virgin olive oil has almost always its unique aroma and taste and it is never neutral. An olive oil that has beyond 0.8 acid degrees is considered to be perfect! In Palestine, the elderly people did not cut the branches annually. Year to year though they noticed that the trees that had broken branches due to snowfall had greater production that the others. Olive Oil is perishable. It is generally better when it is fresher. Certain chemical components degrade over time and other conditions develop like rancidity. These changes effect the nutritional value, shelf life and taste of the oil. When olive oil is exposed to air, light or heat, it deteriorates and can become unfit for consumption. Rancid oil is harmful. Olive oil should not be stored in the refrigerator. When olive oil is chilled, it becomes cloudy and can even solidify and crystallize. While this does not harm the oil, it may affect the texture and consistency. • POLYPHENOL –natural antioxidant substances that determine the level of bitterness and pungency (whether it is mild, medium, or robust/bold). The higher the level, the healthier the oil. It destroys substances that produce cancer cells proliferation. • OLEIC ACID – Its high resistance to free radicals helps slow the spread of damaging chemical-chain reactions. Levels must be between 55 and 83. The higher the oleic acid, the better the oil. The higher the oleic acid content, the higher the nutritional value and the shelf life of the oil.